2019 is our 40th anniversary!!!!! We put up the 2019 category in the Masks section and will update with re-releases, new paint schemes and new masks as they are completed. John Smith, Jeremy Bohr, and I will be doing new sculpts. I have talked to a couple of master scupltors as well, but details re still in the works. Production has kept me super busy since Halloween, but I should be able to start sculpting very soon. 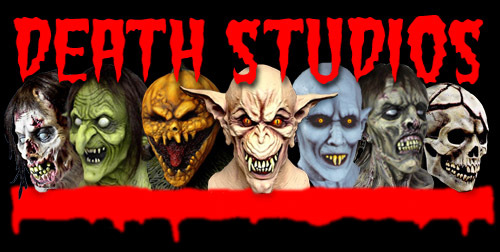 All of the masks ordered directly through this website are personally cast, trimmed, and airbrushed by the owner, Jeff Death. All of our products are satisfaction guarantied. If you do not like it for any reason you may return it for a full refund or credit (minus postage). We do NOT charge your credit card until your item is ready to be shipped. When you submit the order form, you will get a confirmation page with confirmation number. Our webpage has a flaw, so automatic emails are not sent. If you get the confirmation page, we DID receive your order. If you submit the same order more than once, we will not send you multiple masks. We DO ship anywhere in the world. Fill out and submit the order form, then we will calculate international shipping charges and email you for approval. Larger heavier masks may be quite pricey to ship. If the shipping charges are to high for you, we will cancel the order. We started an In-Stock section so that people could see which items are in stock for quickest shipping. If the mask that you want is not on the list, please order it and we will make one up for you asap. We make the masks here in our studio. If you do have a question, it is fastest to call 219-362-4321 between 12a.m.and 6a.m. or 1p.m. and 7pm. I am in the studio at least 12 hours a day, 7 days a week. If you have emailed with a question, please forgive the lateness of the reply. I do not get time to get online very often.If a question is important, please call. There is a phone next to my airbrush so I can answer any and all questions while working. If you receive an error message when submittimg the order form, it may be because of something put in the "special instructions" box of the order form. If that happens, please resubmit the order form and call us with the special instuctions.If you get a confirmation page after submitting, your order went through. For some reason the website has stopped sending confirmation emails.